In 2002 Can Factory worked with a team of partners including: Cisco; Sun; Oracle; Energis; WorldPay; Macromedia; BBCi; BBC Technology; Navyblue and Saviso to complete a build on one of the most sophisticated multi-channel commerce platforms in the world. The system was designed to take donations from Internet and from satellite interactive TV and was the first UK online donations event carried out in tandem with a television program. We designed the application and platform both to cope with massive traffic peaks and to be able to store donations locally when the amount of donations exceeded the capabilities of the banks involved. Building a platform designed to cope with the high bandwidth users as well as the incredible traffic spikes generated by live calls-to-action from the television show presented some unique challenges. The team at Can Factory has been working for over sixteen years on high traffic peaks sites such as Inteflora, Early Learning Centre, Argos and Marks & Spencer. Each sites has a unique pattern of traffic spike, for example Valentine’s Day for Interflora or a Christmas shopping peak for online retailers. One of the unique challenges that Sport Relief and Comic Relief face is that they have only one chance to get it right. Unlike most eCommerce sites, that can ask their customers to come back later, the amount of donations during the show would reduce drastically if the site were down for even an hour. 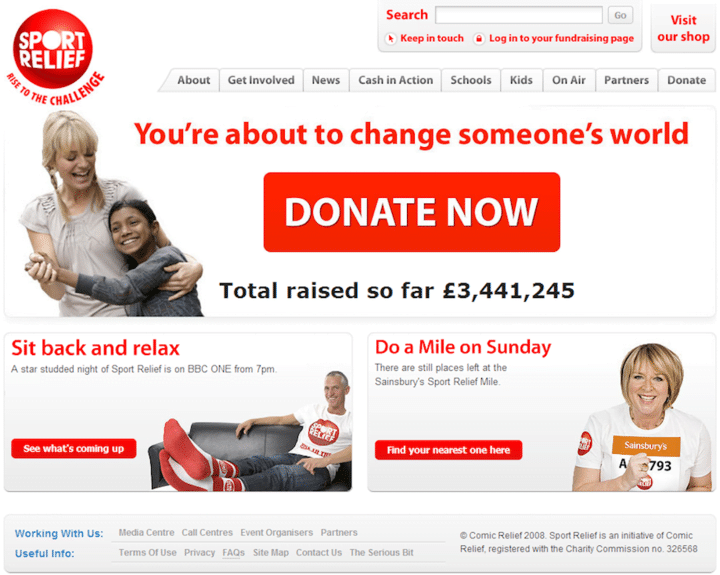 During Red Nose Day in 2005 the site processed over 25,000 donations in less than fifteen minutes: If the platform was not available for any reason during those that period the money raised would have been significantly less. The platform was built on multiple networks, using a pool of load balanced Sun V480 web servers, each with dual power supplies, dual 2 GB Internet connectivity, dual Sun V880 database servers and dual backup generators. This was to ensure that there was no single point of failure in the hardware platform. Cisco provided us with a ground-breaking network environment developed in conjunction with the team specifically for this unique event. Can Factory are able to leverage all of this experience and pride ourselves on building platforms that are guaranteed to take transactions, registration or general content delivery throughout any campaign.